"Although most would agree that oncology cases are the toughest, I am truly challenged by each and every diagnosis, confronting them with a customized plan as individual as each patient,"
Dr. James C. Wittig, Chief of Orthopedic Oncology (Pediatric and Adult) and Director of the Sarcoma Division of the John Theurer Cancer Center at Hackensack University Medical Center in New Jersey has been named one of the top 13 Orthopedic Oncologists in the United States by Orthopedics This Week. 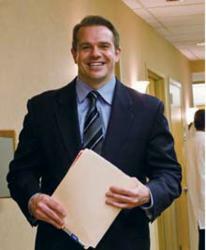 Dr. Wittig is one of approximately 125 surgeons in America who specialize in Orthopedic Oncology. The list was created by surveying thought leaders in the field of Oncology. Dr. Wittig’s continuous recognition validates his compassion and ongoing commitment to treating musculoskeletal cancers with the most innovative advances. “Dr. Wittig is a sought-after specialist who is known for achieving much in the area of limb-sparing surgery. He is a real talent, and is extremely dedicated to his patients,” said one of Dr. Wittig’s peers. In addition, the recent book co-authored by Dr. Wittig entitled, Operative Techniques in Orthopedic Surgical Oncology, has become invaluable in the field and is the ‘one and only’ in-depth guide to Orthopedic Oncology available today. James C. Wittig, MD specializes in limb-sparing surgery; pediatric and adult bone and soft tissue sarcomas; melanoma; benign musculoskeletal tumors; metastatic cancers; as well as complex hip and knee replacement surgery. He also has special expertise with regard to tumors that affect the shoulder girdle and scapula. In addition to his Hackensack University Medical Center office located at Continental Plaza, 433 Hackensack Avenue, 2nd Floor, Hackensack, NJ, Dr. Wittig has an office at Mount Sinai Medical Center located at 5 East 98th Street, New York, NY, and a satellite office with Morristown Memorial Hospital at NJ Advanced Musculoskeletal Center, PA, 131 Madison Avenue, Suite 130, Morristown, NJ. Currently, Dr. Wittig is Chief, Orthopedic Oncology and Director, Sarcoma Division of the John Theurer Cancer Center at Hackensack University Medical Center as well as an Associate Professor of Orthopedic Surgery, Chief of Pediatric and Adult Orthopedic Oncology and the Sarcoma Program at Mount Sinai Medical Center in New York City. He is a member of the American Academy of Orthopedic Surgeons; New York State Society of Orthopedic Surgeons, Inc.; and the Medical Society of New Jersey. He has published over 90 educational materials ranging from original reports, abstracts, videos and articles in the following publications: Clinical Orthopedics and Related Research, The Journal of the American College of Surgeons, American Family Physician, Journal of Arthroplasty, Radiology and Journal of Bone and Joint Surgery. He is also a prominent lecturer in the field of Orthopedic Surgery throughout the nation. Dr. James C. Wittig has been interviewed in national and local print, TV and radio outlets including The Dr. Oz Show, New York Daily News and other publications. He has also been recognized as one of “The Nation’s Top Doctors” by New York Magazine. For more information about this or other related topics, or to schedule an appointment, please call 1-855-DRWITTIG (1-855-379-4884), visit http://www.TumorSurgery.org or email Dr. Wittig at drjameswittig(at)gmail(dot)com.